Strolling through the streets of Palermo Viejo, the trendiest neighborhood in Buenos Aires right now, one wouldn't guess that the city is emerging from an economic crisis. The jacaranda trees are in bloom, and well-dressed porteños (the nickname for residents of the city) pour out of new restaurants, where they can be seen smoking, drinking and laughing. 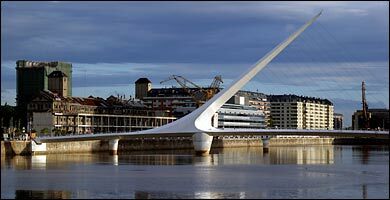 Puente de la Mujer, designed by Santiago Calatrava. At some of the city's hottest restaurants, it is impossible to get a reservation, even a few days in advance, and in response to the influx of foreign visitors, new hotels are opening all over town. While other parts of the world are becoming increasingly expensive, because of the fall of the dollar, Americans visiting Argentina can still capitalize on a very favorable 3-to-1 peso-dollar exchange rate, which Argentina's central bank seems to be committed to maintaining. Before the brutal currency devaluation in 2001, from which the country is still reeling, the Argentine peso was linked to the dollar at a one-to-one ratio. 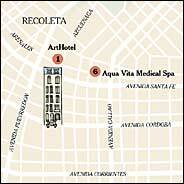 The Recoleta neighborhood remains a popular destination for travelers because it is quiet, safe and central. A good option there is the (1) ArtHotel, 1268 Azcuenaga; (54 11) 4821-4744; www.arthotel.com.ar , which opened in March 2004. A couple of blocks away from the heart of Recoleta's shopping district, the boutique hotel is decorated with wrought-iron doors, a spiral staircase and huge arched windows. The bright, airy lobby doubles as an art gallery (hence the name) where young Argentine artists show their work. For the first week of each month, there is a party to celebrate the work of a new artist. Rooms start at $65 a night at $3 to the Argentine peso and include breakfast. Click Image to Enlarge the complete map. In the increasingly popular Puerto Madero neighborhood, with its seductive waterfront views, well-heeled tourists have begun flocking to the (2) Faena Hotel + Universe, 445 Martha Salotti; (54 11) 4010-9000 or www.faenahotelanduniverse.com . The interior - all black marble, red velvet and glass, festooned with white plaster unicorn heads - looks like what might happen if David Lynch and Ian Schrager had a lovechild. It is quite striking, if a bit cold and peculiar. The brainchild of the Argentine businessman Alan Faena and the French hotel designer Philippe Starck, the Faena cost $100 million to build, and opened in October. (Rates range from $300 a night to $1,200 for the 900-square-foot Porteño suite.) But part of the hotel is still under construction, and amenities like the Turkish bath and the spa service will not be ready until January. Indeed, only 40 percent of the rooms are in service now. If nothing else, this is an Atkins-friendly country: per-capita beef consumption is the highest in the world. At a traditional parrilla (steak house), you can get a delicious cut of beef for about $3. Empanada shops abound, where little meat-filled snacks cost less than a dollar. Meanwhile, new fusion restaurants have been popping up in Palermo Viejo, featuring the work of adventurous chefs. After you've checked out the (3) Casa Rosada (a k a the Pink House, the Argentine equivalent of the White House), in the center of town, you might feel a bit nostalgic for Argentina's Belle Époque. Go to Argentina's oldest bar, (4) Café Tortoni, Avenida de Mayo 825; (54 11) 4342-4328, and sit amid bronze busts of Jorge Luís Borges and paintings of Evita Perón. Grab a beer and a lomito (steak sandwich) for under $10. One recent addition to the Palermo Viejo dining scene is (5) Olsen, 5870 Gorriti; (54 11) 4776-7677, where the executive chef, Germán Martitegui, creates his signature Scandinavian-Argentine fusion cuisine in a blond-wood palace of modern design. Start with a caviar appetizer paired with samplings of various vodkas and aquavits. For dessert, try the molten chocolate cake filled with a hot dulce de leche core, and swimming in a white chocolate yogurt sauce. And if you ever doubted that Argentines eat dinner late, note that Sunday brunch at Olsen is served until 8:30 p.m. When you arrive in Buenos Aires, it will probably be before noon, after a long, and - if you are in coach - uncomfortable flight. The best way to dive headfirst into vacation bliss is to visit a day spa. At the (6) Aqua Vita Medical Spa, 1965 Arenales; (54 11) 4812-5989, in Recoleta, you can get the Aqua Luna treatment, which includes an hour massage, followed by a body-exfoliation treatment for the equivalent of $60. Two and a half hours later, you'll walk out feeling like a piece of tenderized meat. The newest museum in town is (7) Malba, short for Museo de Arte Latinoamericano de Buenos Aires, 3415 Avenida Figueroa Alcorta; (54 11) 4808-6500. Opened in 2001, the museum's permanent collection features 20th-century works from 78 Latin American artists, among them the Mexican painter Frida Kahlo and the Chilean surrealist Roberto Matta. For a big, festive night of tango, try (8) El Querandí, 312 Peru; (54 11) 4345-0331, in San Telmo. The elaborate nightly show, featuring dramatic dancing and some of the best Argentine crooners you'll ever hear, includes a traditional three-course dinner (salad, beef and dulce de leche flan), and costs around $45 a person. For a more intimate setting, and a smaller check, try (9) La Bodeguita del Tango at the Molière theater, also in San Telmo, 678 Balcarce; (54 11) 4343-0777). As for clubbing, (10) Opera Bay (225 Cecilia Grierson; (54 11) 4315-8666, is the place to sweat Saturday nights away. The huge Puerto Madero dance hall, built to resemble the Sydney Opera House, has a cover charge of $15. The hall is also host to an "after office" party on Wednesdays, starting at 11. If you find yourself wandering the streets of Palermo Viejo at night, try an inventive cocktail or two at the low-key watering hole (11) Mundo Bizarro, 4802 Guatemala; (54 11) 4773-1967. A place to find out about the biggest parties is www.whatsupbuenosaires.com , a site started by an American expatriate banker-turned-D.J. Every weekend there's a colorful hippie-ish crafts fair, (12) Feria de Arte, in Palermo Viejo's Plaza Julio Cortázar (Serrano y Honduras), where more than 40 vendors will sell paintings, clothing, handmade jewelry and home furnishings. The whole neighborhood is peppered with little boutiques selling the wares of new Argentine designers, where tourists can get fashionable clothing at reasonable prices any day of the week. (13) Mercer, 1686 Gurruchaga; (54 11) 4833-4587, sells trendy casual clothing for men; try on the jeans. Across the street, there's (14) Fortunata Alegría, 1739 Gurruchaga; (54 11) 4831-8197, where you can find delicate women's dresses and cute tops. Cafe life is vital to residents, who call themselves porteños. Take an evening walk along the water in Puerto Madero. After 100 years of disrepair, the city began a revitalization campaign for the old port in 1989, and today just about everything along the waterfront is new. Head over to the promenade along the waterfront. The historic brick buildings that line the canal now house some of the finest restaurants in Buenos Aires, most of which have tables outside facing the canal, which gives a perfect opportunity to enjoy a crisp glass of Mendoza wine. Cross the canal by the new modern footbridge - the Puente de la Mujer, (15) or Bridge of the Woman - designed by the Spanish architect Santiago Calatrava. (The asymmetric design was intended to evoke the image of a couple doing a tango.) On the other side, you can see the lights of the city sparkling in the distance. International flights land at Ezeiza International Airport (officially Aeropuerto Internacional Ministro Pistarini de Ezeiza), approximately 20 miles southwest of the city. From there, a taxi will cost about $25. From New York, airline prices to Buenos Aires vary, but in high season typically run in the $1,000 range for a 21-day advance-purchase coach seat on American Airlines, which flies direct from Kennedy Airport in New York. The flight is 10 hours 43 minutes. Cabs in Buenos Aires are abundant and cheap. Rarely will a ride through town in a yellow-and-black radio taxi cost more than $3. The more adventurous traveler may choose to use the Subte subway system, which is the oldest in South America. Trains run from about 5 a.m. to about 10:45 p.m., and rides cost less than a quarter. Maps can be found at www.subte.com.ar .